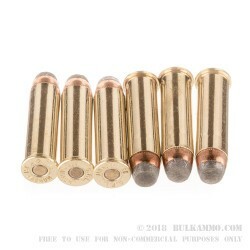 Fiocchi has this knack for offering very good 357 magnum ammunition at ridiculously low prices, making it continuously competitive for shooters who are sick of paying too much for their favorite calibers. When it comes to producing good ammunition at a great price you need to, as a producer, have some high-level control over your process. Fiocchi does have control over its processes. In fact, they are so good at managing processes in their product cycle, that they have evolved into ownership positions for all of the component parts that they use for production of all their ammunition. That’s right, Fiocchi owns the process and produces every component in house. 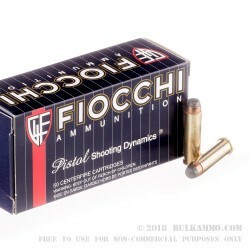 It means that when components on the broader market get scarce, Fiocchi can still deliver great ammunition for cheaper than most producers. 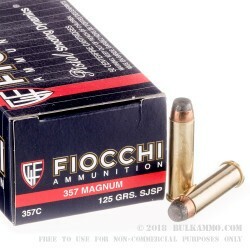 This .357 Magnum offering by Fiocchi continues a great tradition of offering clean, reliable ammunition to American shooters (they offer them to other countries too, mind you). This is a 125 grain semi jacketed soft point projectile with a great set of static ballistic numbers (as follows). The velocity out of the bore is 1500 feet per second and the energy is 755 ft. lbs. 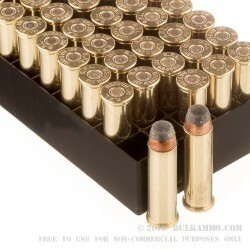 This is a case of 1000 rounds of this excellent ammunition.